Peerless Road has been a recycling site for British Columbia’s Cowichan Valley Regional District (CVRD) since the 1970s. Since its early days, the Recycling & Waste Management Division of Cowichan Valley has always made the recycling site available to residents in Ladysmith, Saltair, Chemainus, North Oyster, and Cedar. Over time, the site’s layout became inefficient for recycling purposes and difficult to access, especially in wet conditions. By the end of 2011, the only leftover from the site’s original purpose was a 45,000m3 pile of incinerator ash (the same volume as 20 hot air balloons). The site had become home to blackberry bushes, weeds, and brambles, giving the pile a vaguely greener but unkempt look. However, that all changed in March 2012, when the federal government announced it would provide funding to help transform the site. The project might have been stopped almost immediately, when estimates to remove the ash pile got as high as $8 million. But a stroke of genius at this early stage set the trend for how the development of this site would be handled right up to its opening ceremony almost exactly two years later. A closer look at the ash revealed that it included metal residues forged together in the incinerator heat. Astonishingly, 125 tons of metal was extracted from the ash and recycled. The ash was compacted and converted into an engineered ‘cell’ that became the foundation for the new site. Such ingenuity at the start of the process helped free up more funds, enabling the old incinerator building to be restored rather than torn down. This has now become the central recycling building at the heart of the site. But even more items were re-used as the project continued. Anything new on the site was constructed in as green a fashion as possible. Tree stumps were collected and re-used to serve as a habitat for amphibians and small mammals that had used the site as their home long before it became a recycling center. The roofs of any new buildings were designed to manage storm water run-off. New windows were double-glazed for insulation, new plumbing included high-efficiency fixtures and toilets, and even the paint was ‘low-VOC’ (volatile organic compound). The ash that had been an accumulating eyesore for decades became the base for 21 brand-new drop-off bays for large or heavy appliances. When Peerless Road re-opened in March 2014, it had become a recycling ‘best practice’ case study. Serving around 17,000 people, of whom about 3,000 visit the site every month, Peerless Road is now able to accept more than 650 different items for recycling! These range from regular household recyclables and organic food waste to a myriad of household appliances, power equipment, oil, antifreeze, scrap metal, lighting, textiles, batteries, tires, thermostats, and even rubble from construction sites! Peerless Road’s redesign allows residents to have a one-stop-shop for all their recyclable items, making it convenient for them to participate in the municipality’s recycling efforts. 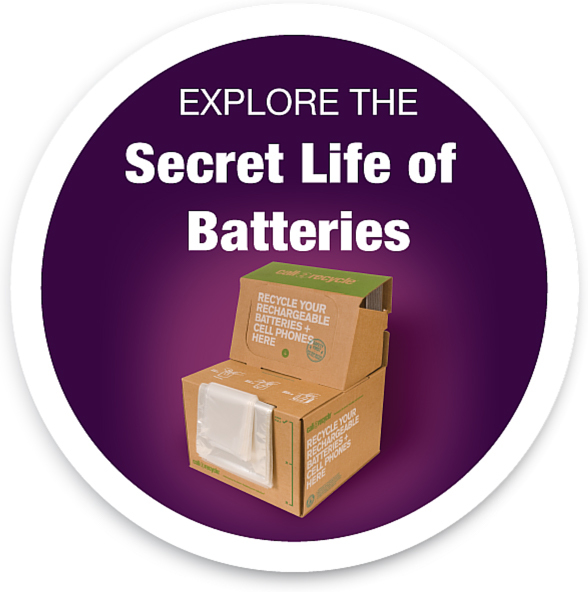 As a Call2Recycle program participant, Peerless Road provides residents with a convenient place to recycle batteries.